Share your story how you started covering and write what hijab means to you. 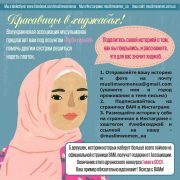 Send your story and picture to e-mail: muslimwomenua@gmail.com (Please mention your name and city in e-mail subject). Five women, which stories will get more likes on the official page of the association, will receive gifts from the association. End of the contest is May 1 at 12:01 am. UMWA is always with you!